Červená Lhota is a château about 20 kilometres (12 mi) north-west of Jindřichův Hradec in south Bohemia, Czech Republic. 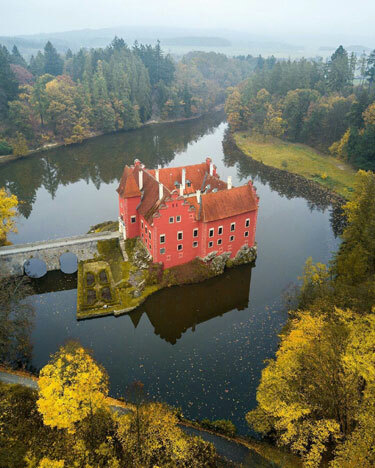 …Its name Červená Lhota* meaning “red lhota” can be explained by the colour of the château’s bright-red roof tiles. … [Acquired by the knightly family of Káb of Rybňan sometime around 1530. The family had the original Gothic castle rebuilt and the basic Renaissance remodelling carried out between 1542-1555. …The four-winged two-storey château, with a small courtyard in the center, occupies the whole rock and juts into the fishpond. A stone bridge, built in 1622, links the château with the banks of the pond, replacing the original drawbridge. These days, the Russian aggression against Ukraine is causing NATO maneuvers all over Central Europe in an effort to send a message to Vladimir Putin. 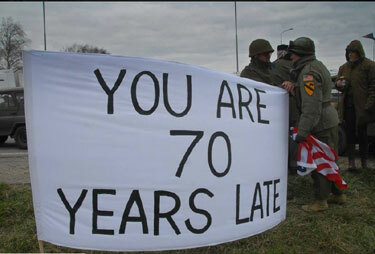 Upon arriving in the Czech Republic, US soldiers were welcomed with this sign. 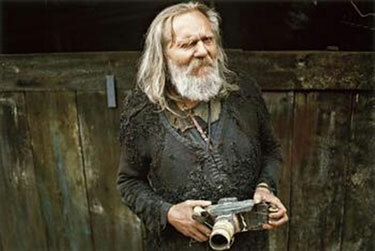 The Czech photographer Miroslav Tichy produced his own cameras from whatever parts he could find in the garbage. From that source came everything – from camera bodies to glass lenses. He was considered a mad hermit, but he did not care. Covertly, Miroslav Tichy wandered around the city in tatters and photographed women with his home-made camera. Years passed and he was “discovered” – the former tramp became a celebrity, and his pictures are now worth tens of thousands of euros and are exhibited in top galleries. 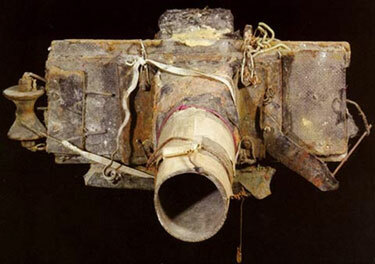 One of Tichy’s home-made cameras. One of Tichy’s characteristic soft focus female images. Miroslav Tichy… from the 1960s until 1985 took thousands of surreptitious pictures of women in his hometown of Kyjov in the Czech Republic, using homemade cameras constructed of cardboard tubes, tin cans and other at-hand materials. Most of his subjects were unaware they are being photographed. A few struck beauty-pageant poses when they sighted him, perhaps not realizing that the parody of a camera he carried was real. His soft focus, fleeting glimpses of the women of Kyjov are skewed, spotted and badly printed — flawed by the limitations of his primitive equipment and a series of deliberate processing mistakes meant to add poetic imperfections. During the Communist regime in Czechoslovakia, Tichý was considered a dissident and badly treated by the government. His photographs remained largely unknown until an exhibition was held for him in 2004. Hat tip to Viktorija Ruškulienė. Debkafile, which reported August 29th a leak (apparently from Polish sources) that plans were underway to substitute defense facilities in Turkey and Israel for those originally intended to be sited in Poland and the Czech Republic, is now telling us that Obama has made a deal to site US missile defense systems on a Russian military base in Azerbaijan (!). Steve Bodio links this short 0:10 video of an eagle taking a roe deer in the Czech Republic. the Archives of Never Yet Melted in the 'Czech Republic' Category.